What's one of the manliest things you can learn to do? Throwing a knife, that's right, it's up there with wrestling an alligator and smoking a cigar. 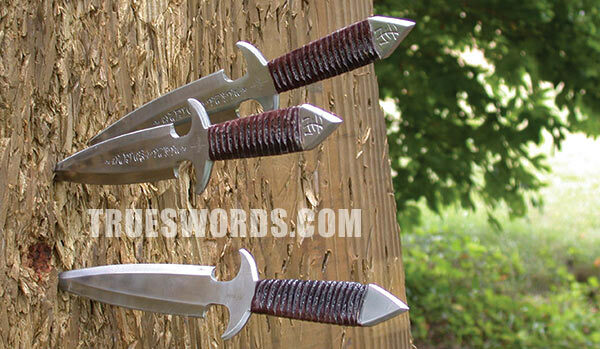 The art of throwing knives has been around for centuries. Why not keep that tradition alive and well and learn yet another way to show up your father-in-law at the family barbeque? There's technique behind throwing a knife correctly and with practice you could be zooming knives through the air with the best of them! When you're just beginning to learn the proper techniques of knife throwing, be patient and eventually a lot of seemingly simple movements will mesh into the perfect throw! We're going to look in depth at how to grip the knife, the proper stance and delivery methods and last but not least the release and timing of the throw. These elements of knife throwing are crucial to mastering the art. There are different types of grips you could utilize in knife throwing such as the hammer grip, the vertical blade grip and the horizontal blade grip. Arguably the most versatile grip and easiest to master is the hammer grip. As the name suggests, you grip the knife in the same manner you would if you were holding a hammer with your four fingers cupping the handle of the blade and your thumb vertically aligning with the top of the knife's handle. If you're fond of double edge blades, you'll especially love this grip. When it comes to the best of the best in the knife throwing field, they all have one thing in common: practice! You want to make the same movements with your arm and body over and over again until you feel a consistency in your movement. To begin with, you want to mark the spot you will be throwing from, because distance and trajectory are important elements that play into calculating your throw. If you are right side dominant, you want your right foot about 1 foot behind your left foot; vice versa if you are left side dominant. To add comfort and steadiness to your stance, you may prefer to slightly bend your knees. Bring the hand with the knife in it up until it is slightly behind your back and the blade is pointing at the sky. Then begin swinging your hand towards the target. Some throwers also use their non dominant hand as an extra means of balance and coordination. To do this you will need to bring your non dominant hand up from your side as you raise the hand with the knife in it above your head. You will continue to raise your non-dominant hand until it is level with the bull's eye of your target. Many knife throwing beginners make the mistake of placing too much thought and emphasis on the release of the knife. Obliviously this is an important aspect of throwing a knife, but it should be natural. The release is one of the elements in throwing a knife that will become second nature to you the more you practice. What we can tell you is that there should be little to no wrist action. If you flick your wrist as you release the knife, it can affect the natural rotational spin of the knife. Even if you had a successful throw with wrist action, it would be nearly impossible to duplicate over and over again. When your arm is fully extended, let the knife slide out of your grip, it's that simple. Also, if the handle of the knife is pointing up, you are too far away. Try moving up a few inches. Likewise, if the handle of the knife is pointing down, you are too close and should step back a few inches.